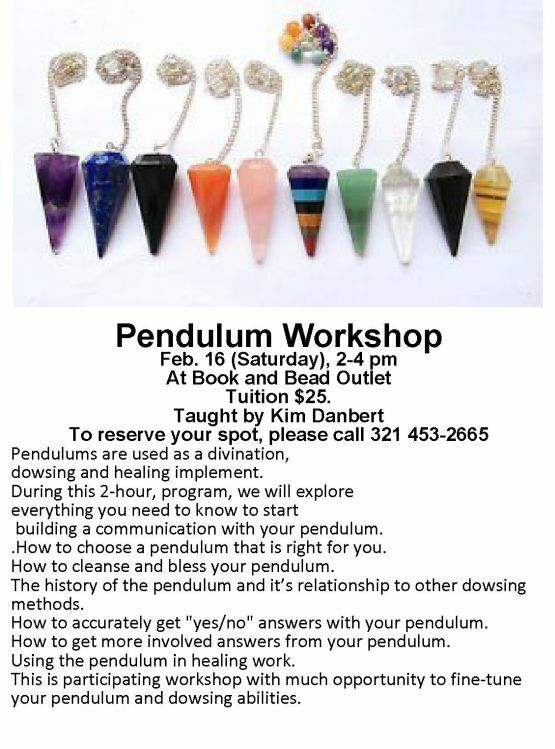 Kim Danbert will be teaching the Pendulum Workshop. This workshop will include: How to choose a pendulum that is right for you, how to cleanse and bless your pendulum, the history of the pendulum and it’s relationship to other dowsing methods, how to accurately get “yes/no”answers with your pendulum, how to get more involved answers from your pendulum, and using the pendulum in healing work. The price for the Pendulum workshop is $25. PLEASE CALL IN ADVANCE TO RESERVE YOUR SPOT(S) AT 321-453-2665.